We were scouting out the Power Plant Mall's ground floor for some good place to eat. I wanted some Japanese but I was alone in that thought. 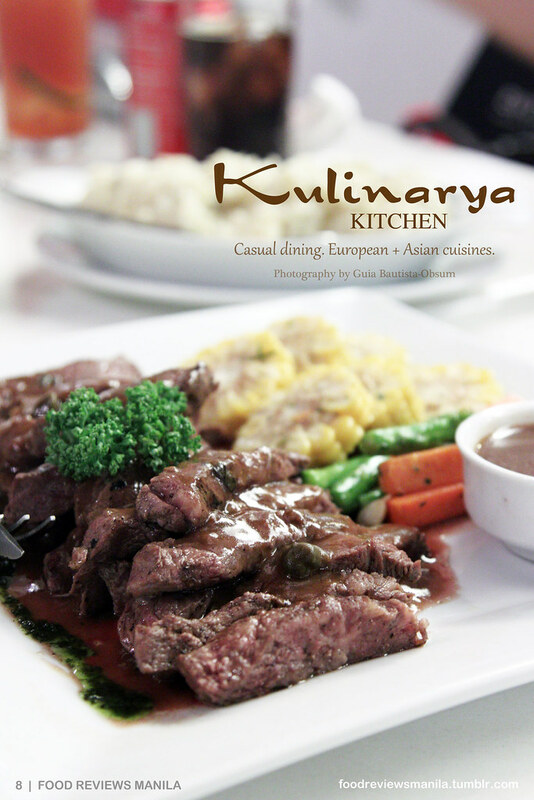 Walking past Kulinarya Kitchen, the restaurant seemed elegant and attractive with its dark wall interiors and light-colored furniture. Black candelabras hang from the ceiling with strings of raven-hued teardrop gems daintily dangling underneath. It shouted regal instead of gothic, and if the set up pretty much reflected the food, then it may be worth a try. 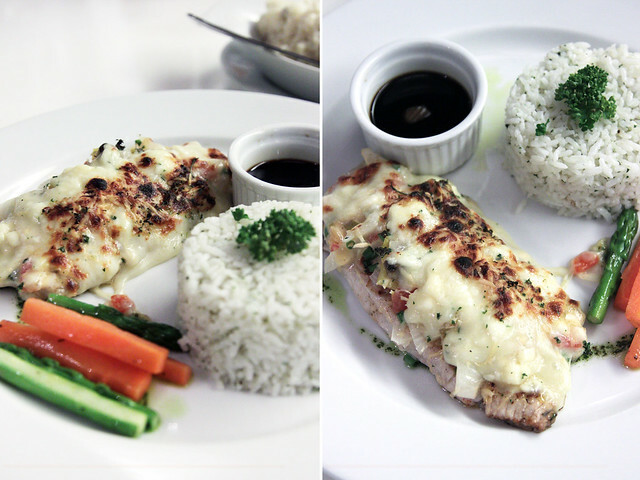 The Baked Bangus Belly (P285) is a strip of milkfish with an overlay of tomato and onion relish encrusted with oven tarnished mozzarella gratin. The fish is fork tender and exudes much flavor, emphasized by the relish and curbed by the sweetness of the cheese. The contrasting sweet sour salty flavors of the soy-vinegar dip only further enhances the flavor profile of the dish. All these are tamed down by the parsley butter rice, giving the dish its needed balance. As with the bangus, the Grilled Pork Chops (P250) were tender and flavorful. I didn't get to taste the Indian rice, albeit it sounds intriguing with its brown grains and a tuft of crimson jelly strips look-alike on top. 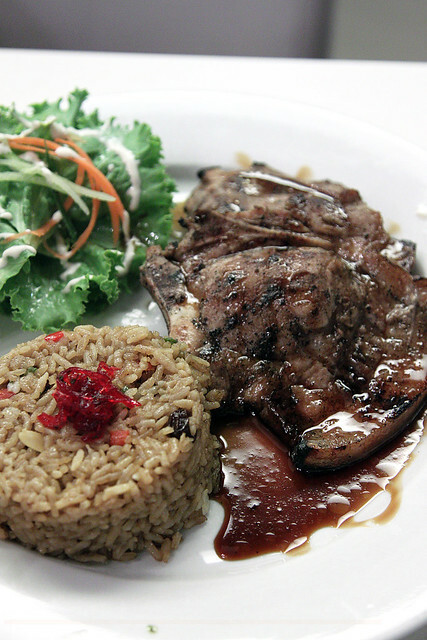 The herb marinated pork chops are doused with sweet soy reduction, the sapidity of which I very much appreciated. 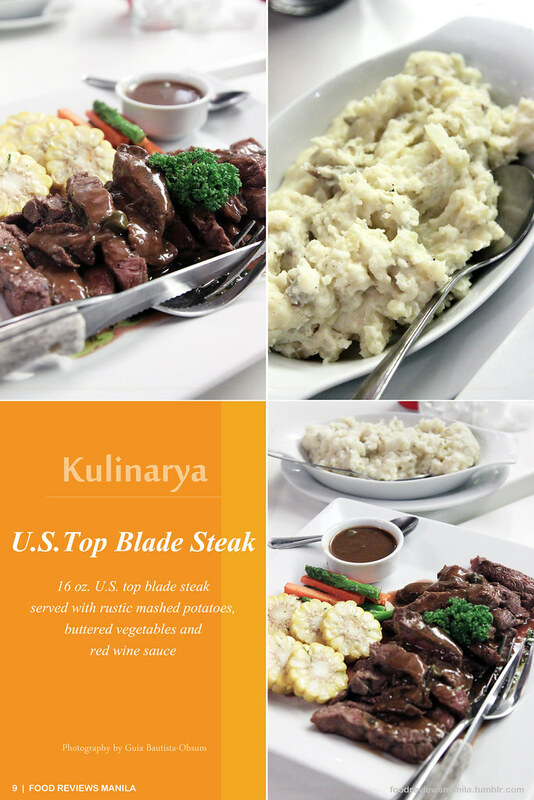 We all wanted some steak so we opted for the family platter of U.S. Top Blade Steak (P995). I love red wine sauce poured over a good slab of meat so this was fitting for me as well. The medium well steak was sliced into strips, a bit of pinkish meat evident in the slim center of each piece. I love the bold and rustic flavors of the beef which was clearly marinated well. It was so tender even after several minutes of being exposed to the air. There was no irritating rubbery texture, just a clean cut teeth-friendly bite. Buttered slices of corn, carrots and asparagus lay adjacently to each other and a medium-sized oval baking dish carry a generous portion of mashed potatoes. Though I still like Friday's version better for its savory chunks, smothered with red wine sauce, this pretty much comes close. 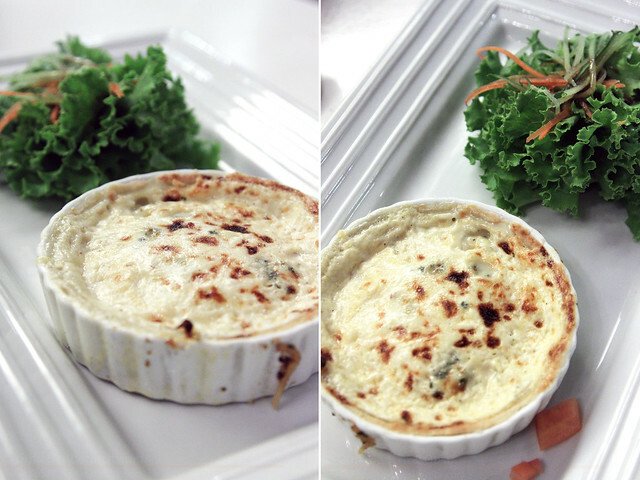 The 4-Cheese Quiche (P175) comprises swiss cheddar, gruyere, gorgonzola and parmesan. A wisp of hot smoke escaped as I cut through the savory pie. It was simply delicious; well the fact that I love those sharp tasting cheeses doesn't hurt. Each bite let out a mosaic of alternating tastes -- sweet, salty, a bit sharp and tangy, plus even a tincture of earthy flavor. It was rich, creamy, a little dense yet delicate. A celebration of the long and tedious process that goes into making these types of dairy. As I was perusing the dessert menu, the word 'sans rival' caught my eye. Naturally all else seemed like a blur especially when the duo of words was married with the term 'pistachio'. 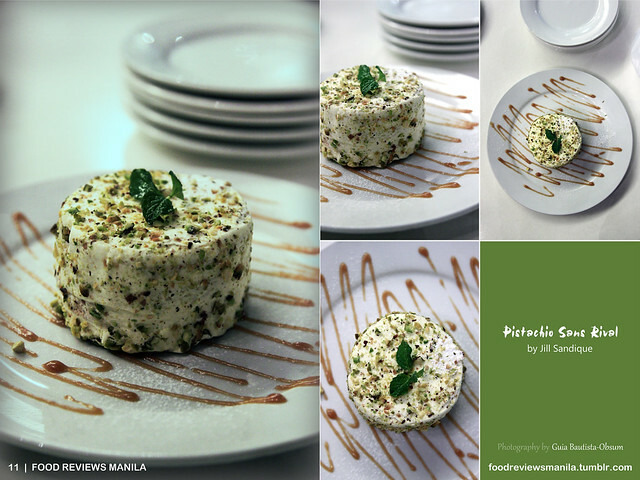 I queried if this was the famous Pistachio Sans Rival (P200) of Jill Sandique and they confirmed that it was indeed. I needed no further prodding and went ahead to order one for myself. Or so I thought. A few minutes of eager anticipation was rewarded by a small round meringue cake covered with butter cream and enrobed in a shower of ground pistachios. This green beauty was topped with a foliage that remotely looked like mint though I can't be sure, and sits seductively on a plate drizzled with caramel and dusted with powdered sugar. My fork descends easily through layers of smooth buttercream and requires the lightest of efforts through the crispy layers of meringue. As I swallowed my first forkful, a short trail of profanity escapes my lips, though I hope it sounded softer than it did inside my head. A soft crunch can be heard concurrent with the buttercream's coating of my tongue. Dots of pistachio bits lovingly graze my palate and I'm transported to cake heaven. As I come down from my pastry cloud, I noticed a couple more dessert forks lying on the plate. I look around to see my family in an equally dreamy state, and my cake just a mere wedge(!). So much for having it all to myself. I polished it all off before somebody else robs me of the last remaining bites. 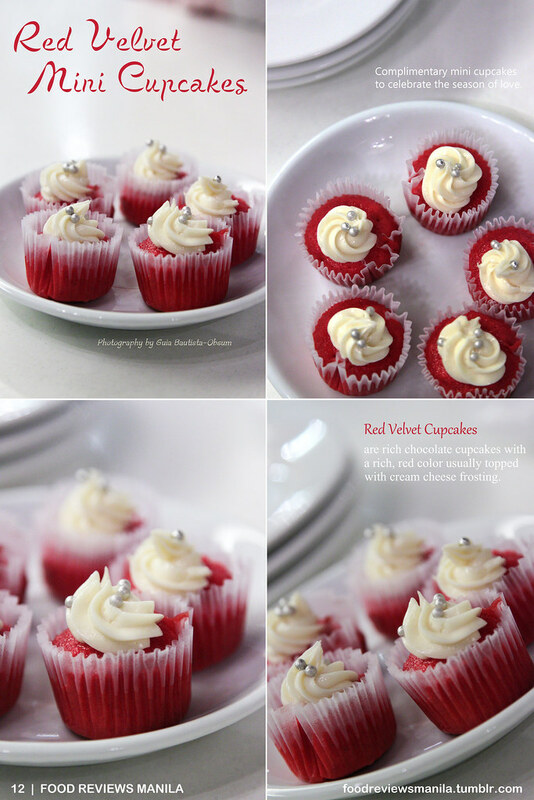 At the end of our meal came a surprise in the form of five little red velvet cupcakes. Our waists were all bursting at the seams and I was mentally debating if I had the space for even a tiny cake. Them having no box we could put it all in to bring home settled the matter. I reached for a piece and took a tiny, careful bite. Goodness gracious! I'm running out of descriptive words. The luscious cream cheese frosting paved the way for a delicate, moist red chocolate cake that was pillowy soft and just surrenders to the bite. Small silver orbs strewn sporadically over the frosting's crannies meanwhile serve as an interlude, a welcome textural contrast to the suave dessert. A repartee of cream cheese sourness and chocolate sweetness echoes throughout the palate, making for an even deliriously fulfilling end to a good meal. I always rely on your reviews for good eats! 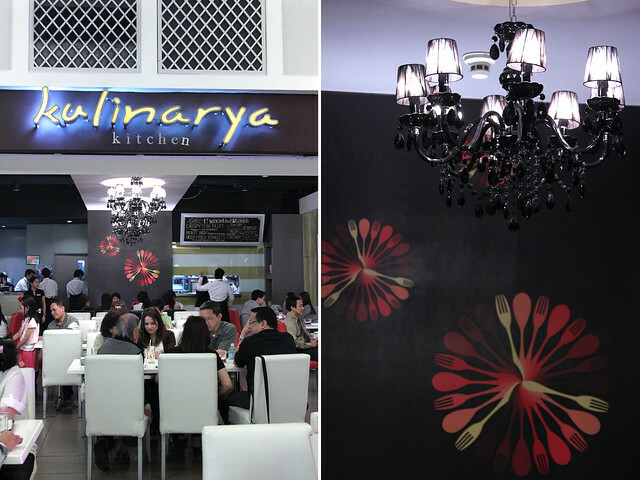 Kulinarya Kitchen looks amazing! P.S. Thanks to you, I also fell in love with Royce Nama! everything looks amazing!! ang hirap mag-diet when you see stunning photos of food!